During the early 2000s, the Great Lakes Coastal Wetland Consortium (GLCWC; see Ingram et al. 2004), consisting of both U.S. and Canadian scientists and policy makers, worked together to create a Geographic Information System (GIS)-based coastal wetland inventory for all five Great Lakes (see map above). 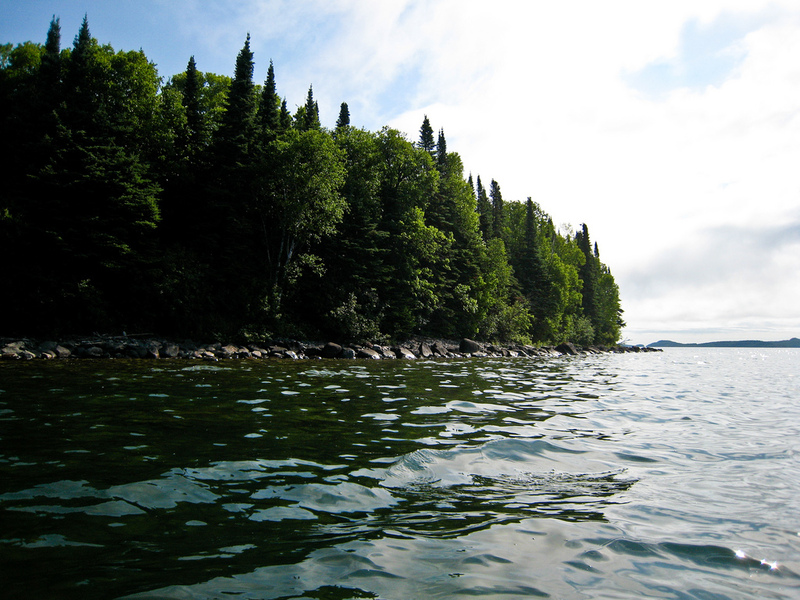 The GLCWC aimed to identify all existing coastal wetland habitat along the Great Lakes shoreline that were >2 ha in size, using the most up-to-date sources. 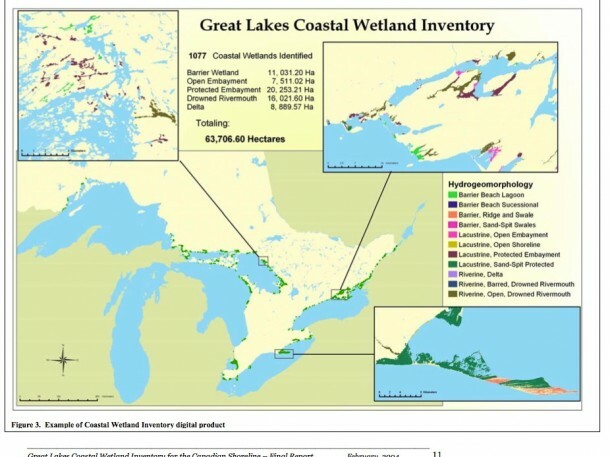 The Canadian dataset included all wetlands in the Ontario Great Lakes Coastal Wetland Atlas (OGLCWA), which was published by Environment Canada and the Ontario Ministry of Natural Resources in 2003 and included all wetlands evaluated by the Ontario Wetland Evaluation System (OWES). Information used in the atlas dated back to 1983 and were updated with information current to 1999. These evaluated wetlands occurred primarily in Lakes Superior, Erie, Ontario, as well as all connecting channels, and were used as a starting point. All wetland boundaries in the OGLCWA were verified with aerial photos, and in regions where no wetland had been evaluated, an expert manually identified wetlands using available aerial photographs. 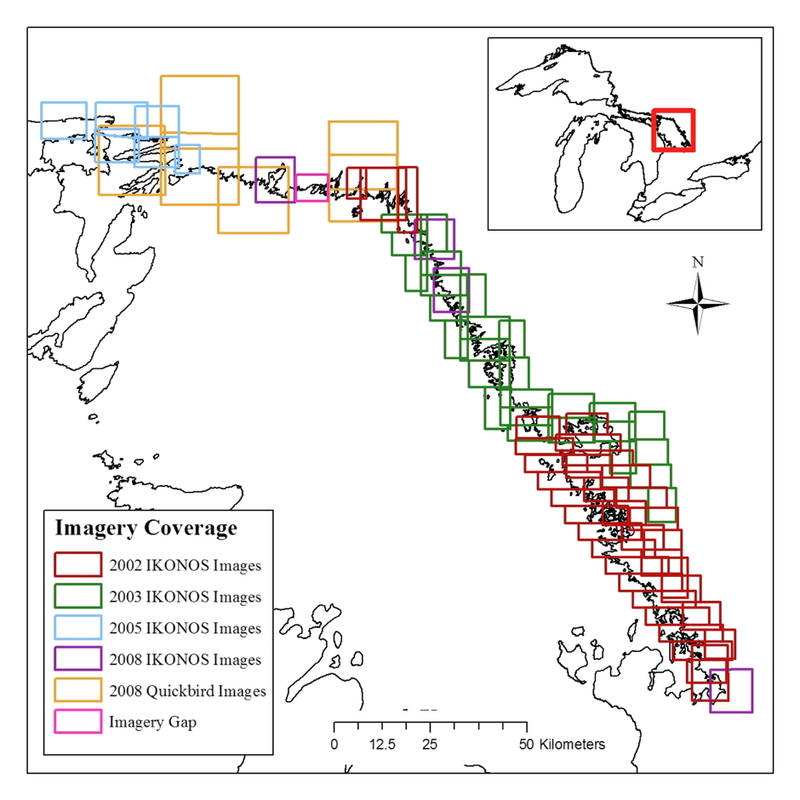 For the eastern Georgian Bay region, aerial photographs (taken in the summers between 1984 to 2000) were available at a scale of 1:10 000 from Severn Sound to Parry Sound, and this allowed for a pixel resolution of 0.4 m. From Parry Sound to Key River, however, photos were only available at a scale of 1:20 000 (taken in the summers between 1986 to 1996), and allowed for a more coarse pixel resolution of 0.8 m.
Although the GLCWC inventory includes wetlands standardized for both Canada and the United States, it is not comprehensive for Georgian Bay, specifically, in northern and eastern Georgian Bay, where aerial photography had incomplete coverage. Many island archipelagos and rocky coastal regions had been excluded because the initial acquisition of aerial photographs were for forest survey purposes. Another problem is that wetlands had been delineated from photos taken in different years (1983 to 1999) and at different water levels, and therefore wetland size within the inventory varied according to water level at the time of photo acquisition and could not be compared directly. Lack of information along the shore and in the surrounding islands of eastern Georgian Bay is a serious concern because this region holds some of the most pristine coastal marshes in the entire Great Lakes basin. This area is unique due to the low levels of agriculture and urban development that have allowed these wetlands to maintain the highest proportions of disturbance-intolerant fish and plant taxa within the Great Lakes coastal system. Although much of the shoreline was logged prior to the 1900s, easier access to inland logging sites and slow successional growth have prevented continuous logging along the shoreline in the past century. Hence, most of the wetlands have been able to persist in relatively natural condition, free of human disturbance. In addition, watersheds of eastern and northern Georgian Bay have thin, nutrient-poor soils on top of PreCambrian Shield, which has created naturally oligotrophic coastal wetlands with very soft water mixed with more alkaline water of Georgian Bay; this creates unique geochemical characteristics that supports regionally high biodiversity of aquatic plants. Lastly, the complex shoreline of eastern Georgian Bay provides a large concentration of protected embayments and a number of large riverine wetlands. The predominance of thousands of small (<2 ha) shallow rocky embayments which are protected from the strong winds and large waves that characterize eastern and northern Georgian Bay. Therefore, Georgian Bay has an assembly of coastal wetlands that are unique in the Great Lakes basin in terms of geochemistry, biodiversity, areal cover and abundance and can be considered reference conditions for the Great Lakes. Besides the ubiquitous potential for indiscriminate human development, coastal wetlands of Georgian Bay have been strongly influenced by the sustained low water levels that have prevailed over the last decade (see figure below; click on figure to expand). Climate change models predict a further decline in water level of 1 m in Lakes Huron-Michigan over the next 25 years, and this will also be accompanied with reduced fluctuations between years. Since coastal wetlands are dynamic systems, where diversity of habitat and biota are maintained by a natural fluctuation of water levels through the season and from year to year, the current episode of sustained low water levels threaten the high biodiversity of plants and fish communities in eastern Georgian Bay. There is an urgent need to conduct research to determine how this trend towards lower water levels will affect the quantity and quality of wetland habitat in Georgian Bay so that they can be monitored and protected from further human activities. To aid environmental agencies and municipal planners and to enable valid extrapolation, it is important that the research be conducted on a set of randomly chosen wetlands; this however, has not been possible because of the lack of a comprehensive inventory of this region. 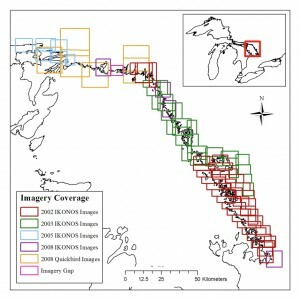 To address this deficiency, Georgian Bay Forever funded Dr. Chow-Fraser at McMaster University to lead the development of a GIS-based inventory of all coastal wetlands of eastern and northern Georgian Bay. Delineation of wetlands in this inventory relied on high-resolution satellite imagery acquired primarily between 2002 and 2005, and filled in majority of the gaps in the GLCWC inventory. The final product, called the McMaster Coastal Wetland Inventory (MCWI), is a comprehensive GIS database that can be used by environmental agencies and municipal planners to protect and conserve the sensitive wetland habitat in eastern and northern Georgian Bay. The map below shows the geographic coverage of all satellite images used to produce the MCWI as well as the year the images were acquired. There is only a small gap of about 20-km of shoreline, for which there was no corresponding satellite image that we could use. Please contact Dr. Chow-Fraser if you are interested in using this inventory for research or management purposes.